The Ducks have acquired defenseman Kyle Cumiskey from the Colorado Avalanche in exchange for defenseman Jake Newton and a seventh-round selection in the 2013 NHL Entry Draft. Cumiskey, 24 (12/2/86), appeared in 18 contests with Colorado last season, earning 1-7=8 points with 10 penalty minutes (PIM). 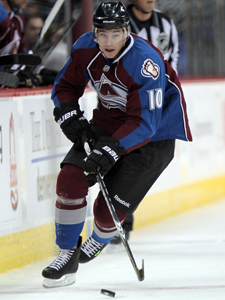 The 5-10, 185-pound blueliner appeared in a career-high 61 contests with the Avalanche in 2009-10, earning 7-13=20 points with an even plus/minus rating. Cumiskey led team defensemen goals that season, notching a career-high two goals on Jan. 18, 2010 vs. Edmonton. He also made his NHL postseason debut in 2009-10, scoring 1-1=2 points in the club’s Conference Quarterfinal series vs. San Jose. In 132 career NHL contests, Cumiskey has collected 9-26=35 points with 48 PIM. Cumiskey made his NHL debut with the Avalanche on Jan. 1, 2007 at Nashville and scored his first career goal in his third NHL game on Jan. 6, 2007 at Minnesota. A native of Abbotsford, British Columbia, Cumiskey was selected by Colorado in the seventh round (222nd overall) of the 2005 NHL Entry Draft. He is also a veteran of 96 American Hockey League (AHL) contests, scoring 13-39=52 points with 52 PIM. Cumiskey played 177 Western Hockey League (WHL) contests for the Kelowna Rockets from 2003-06, collecting 8-67=75 points with 119 PIM and a +22 rating. He was part of the Rockets’ Memorial Cup-winning team in 2004 and also helped the club advance to the tournament in 2005. Cumiskey’s international experience includes playing for Team Canada at the 2010 IIHF World Championship in Cologne, Germany, collecting three assists (0-3=3) in seven contests. Newton, 23 (9/22/88), appeared in 48 contests with the Syracuse Crunch (AHL) in 2010-11, earning 2-7=9 points with six PIM. A native of San Jacinto, CA, Newton signed with Anaheim as a free agent on Mar. 17, 2010 following a season of collegiate hockey with Northeastern University (Hockey East). With the Huskies, he scored 9-13=22 points with 10 PIM in 34 contests. The 6-2, 207-pound defenseman played two years of hockey with Lincoln of the USHL from 2007-09, scoring 21-42=63 points in 105 games.